Just as the Etowah and Oostanaula rivers flow together to form the mighty Coosa, school spirit courses throughout Floyd County and converges on Rome. This emphasis on education carries significant economic impact to the region, complements its top-flight medical centers and helps attract new companies to northwest Georgia. Remarkably, for a city with only about 36,000 people, Rome has four institutions of higher learning: Berry College, Shorter University, Georgia Highlands College (GHC) and Georgia Northwestern Technical College (GNTC). Georgia Health Sciences University (formerly the Medical College of Georgia), recently began a residency program for third- and fourth-year students in Rome, with the long-range goal of establishing a residential campus. Each college has its own niche, and although their enrollments are not large enough to dominate the city, they help define it. They also shop there, as do the faculty and staff employed by the colleges. McDaniel estimates that GNTC, with an enrollment of about 2,600 students in Floyd County, has an economic impact of more than $135 million (a figure that encompasses all five of its campuses). Berry had an economic impact of $105.7 million for fiscal year 2007, according to the Georgia Independent College Association. The same group found that Shorter (which also has three Metro Atlanta campuses) had an impact of $88.54 million. This year Berry enrolled more than 1,900 students, and Shorter has more than 1,500 – a record enrollment – on its Rome campus. GHC, which has two campuses in Rome for an enrollment of 1,500 to 1,600 students (plus four other campuses in the state), provided an economic impact of $110.7 million during fiscal year 2010, according to a Board of Regents study. The colleges are just one facet of the focus on learning in Floyd County. Rome, the county seat, also boasts the renowned Darlington School, a private day and boarding school for pre-K through high school. The small city of Cave Spring is the home of the Georgia School for the Deaf. The city and county also pride themselves on two public school systems, which are ranked in the Top 15 in the state, and the Floyd County Schools College & Career Academy, a charter school that stresses math and science. The educational excellence contributes to the quality of life in Rome and is a chief selling point to businesses looking for a place to locate. 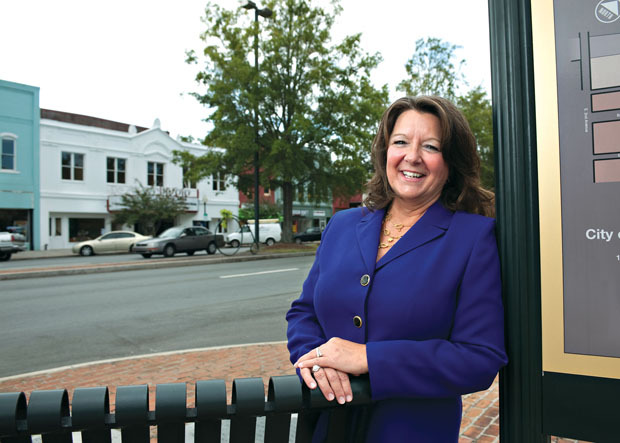 “What industry is going to want to come to a community where the schools continue to underperform?” says Heather Seckman, director of economic development for the Greater Rome Chamber of Commerce. The availability of an educated workforce is another asset. Enter Lowe’s. Floyd County pulled off a major coup in early September by attracting a Lowe’s distribution center to the North Floyd Industrial Park at the intersection of Ga. 53 and Ga. 140. The retail giant says the 1.5-million-square-foot center, which takes up 140 acres of a 375-acre site, could employ as many as 600 people within three years. A package of incentives includes up to $125 million in bond financing, as well as a property tax abatement. The center could open for business as early as the first quarter of 2013. McNiece says she’s most proud of the spirit of cooperation that resonates here. “The representatives of Lowe’s said they had not seen the level of cooperation and coordination as they had witnessed in this community,” she says. Neither do the schools, which peacefully coexist. That’s mainly because each has a different mission, and also because the presidents, plus the Darlington School headmaster, meet monthly to discuss ways they can help each other. They also collaborate on a yearly technology symposium. The colleges have helped stabilize the economy. “In 2008 and 2009 when companies were laying people off, a lot of those employees went back to school and developed new skills to make themselves more employable,” Seckman says. Berry College and Shorter University are both private, four-year liberal arts schools. In keeping with its founding as a school for poor rural students, Berry provides students with work experience on or off campus; 85 percent of the student body have jobs ranging from working in administrative offices to making cheese in the dairy. Despite the economic downturn, Berry has fulfilled long-range building plans, including $55 million for residence hall renovations. On October 19, Shorter celebrated the 100th anniversary of its campus “on the Hill,” its home after outgrowing its downtown Rome digs. Dowless will be inaugurated as Shorter’s 19th president on November 11. Despite being in the midst of a reaccreditation process, Shorter has started a new master of arts in teaching program. It also is finishing its library addition. In May, the Board of Regents of the University System of Georgia allowed Georgia Highlands College to change from a two-year college to a limited-mission four-year institution. Based on a feasibility study to assess interest and need, its first four-year degree will be in nursing. At GNTC, the focus is on skills and workforce development, McDaniel says. About a third of the enrollment is in the allied health program, and the school has a strong relationship with Floyd Medical Center – the county’s largest employer – Redmond Regional Medical Center and the Hardin and Coosa Clinics. The technical school also has a very good relationship with the high schools. “We’re getting more kids out of high schools who are making the technical college their first choice now,” McDaniel says. Darlington School, although not a college, is Rome’s fifth major school. It has 190 residential students from all over the world who pay a combined $5.5 million in tuition. The economic impact of Darling-ton’s resident students in the community is estimated at $2.8 million. “The international students really add vibrancy and add to the cosmopolitan nature,” says Al Hodge, president and CEO of the Greater Rome Chamber of Commerce. When the parents of Darlington students visit and take them into town, they spend a total of $400,000 a year, Whitworth says. Rome now has even more restaurants to enjoy. “The big trend that I see this year is we just continue to grow in restaurants,” says Ann Arnold, director of the Downtown Development Authority. After just one restaurant opening in 2010, there have been four in 2011, bringing the total in Rome to about 16. A Mellow Mushroom franchise brought in 50 jobs. The Partridge Restaurant, established in 1933, is under new ownership that is keeping the name and revamping. The city is also working on a restaurant and a coffee shop that will open before the end of the year. Rome’s downtown has been revitalized around a stadium that once was a candidate for demolition. A plaza is the latest phase in the $3.5 million in renovations and improvements to Barron Stadium, site of the Russell Athletic-NAIA Football National Champion-ship game through at least 2015. Shorter partnered with the City of Rome and Floyd County to develop the bid that brought the game to Rome in 2008. After rain caused the first game to be a muddy mess, the city agreed to replace the grass field with artificial turf. A new electronic scoreboard was also installed. The game was a success, filling the stadium to its capacity of 5,500 and providing a direct economic impact of more than $1.5 million each year, according to the Greater Rome Con-vention and Visitors Bureau. Spectators crossed the walking bridge to downtown, providing tremendous benefits to the merchants. A SPLOST package has funded the sprucing up, including laying down a quality track that will attract big meets. Rome High School and Shorter also use the stadium. He adds that hosting a college national championship game is a good thing to have on a city’s resume. “It’s easier to attract these events than it is one large manufacturing plant,” Berry says. Most recent corporate investment in Floyd County has come through expansion, the chamber’s Seckman says. Petz Enterprises, the tax software preparer that arrived in May, has already expanded into a new facility and is expecting to employ up to 90 people. Thermal Seal Duct Systems moved into an existing facility that had been vacant for a while and was employing 40 people by May. Profile Extrusion Company has added 15 jobs, while Source Medical Solution’s Therapy Billing Services Division added 10. United Medical Response has boosted the economy 20 initial jobs. “We are working with several companies who are looking at our industrial sites, and we hope we can be talking about them very soon,” Seckman adds. He says about 7,000 people a year visit Martha Berry’s home, Oak Hill, and 10,000 visit the campus alone. Another 10,000 visit the Chick-fil-A WinShape Foundation retreat facility, which is also on the Berry campus. In Cave Spring, a welcome center opened earlier this year to promote tourism and activities in the community. To house the center, the Downtown Development Authority purchased a historic property known as Asbury House, which is located at the traffic light on Ga. 411, right in the middle of town. The major employer in the city is the Georgia School for the Deaf. “So much of the history of Cave Spring is intertwined with the school,” Ware says. The relationship is special because many residents and business owners in Cave Spring can communicate with sign language.